It was a dream regular season for the Buffaloes last year. Coming off a 4-9 season in 2015, including 1-8 in the Pac-12, no one expected too much of the program. Few would have seen them getting even close to .500 in the conference, never mind the division winning 8-1 record they did amass. It was a heck of a season. And now some big changes - in both personnel and coaching - face the team. Now coach Mike MacIntyre, a very good coach in his fifth year with the program, has to prove that he can keep the program moving forward despite those changes. Early, wildly-dominating wins against Colorado State and Idaho State proved little but hinted that the offense was ready to fly as they scored a combined 100 points in the two games. The offense was again proven in the third game as they scored 28 against a very good Michigan defense. The issue, though, was that they allowed 45. They then scored 41 and 47 to beat the two Oregon teams - first the Ducks then the Beavers. They lost at USC but looked very solid doing so. That had them at 2-1 in the conference, but they then rolled to six straight conference wins. The most impressive of those six wins was at Stanford, when they shifted styles to win 10-5 in a gutter battle. After winning the division, though, the clock struck midnight for this particular Cinderella. They were crushed by Washington in the Pac-12 Championship, with the 41-10 score certainly representing how lopsided the contest was. And then they got rolled over by Oklahoma State in the Alamo Bowl. As so often happens with overachieving teams, it was as if the whole thing suddenly got to be too much for them, and they were no longer capable of doing what had gotten them to where they were. 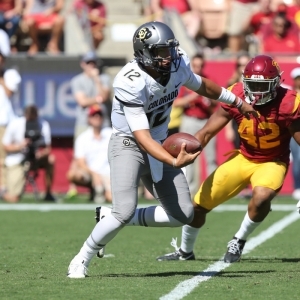 QB Sefo Liufau, a four-year starter who feels like one of those guys who played for a decade, is gone. That is a big change for any team, but it is easier to be optimistic about this team's transition than many. Steven Montez played three games last year when Liufau was banged up, and he looked very good. Now he has an offseason to prepare as the starter, and it could turn out very well. It helps, too, that the team goes through very little key change outside of QB and has an experienced and solid line. If Montez can plug in effectively then this offense should be just fine - and potentially more than that. What's more of a concern, though, is on defense. Coordinator Jim Leavitt did a very good job in his two years there, but he moved on to take the same role at Oregon. D.J. Eliot, most recently DC at Kentucky, takes over. He has big shoes to fill. He also has to deal with some big losses. Two ends and a tackle are gone. So are two linebackers, two corners and a safety. Eliot isn't an inspiring choice, and he needs to massage a combination of raw players and junior college transfers into a workable unit. It's very tough to imagine this team replicating their Top 20 defensive performance from last year - and that will hurt the team significantly. They certainly get to roll into things slowly, with Colorado State, Texas State, and Northern Colorado presenting a pretty smooth path to 3-0 barring a disaster - or 2-1 at the very worst because Colorado State is decent enough and the game is at a neutral site. Hosting Washington next will be much tougher, and a trip to UCLA could be a challenge, too, if the Bruins can finally get out of their own way. Arizona should be a win next, but then trips to Oregon State and Washington State could be tough if the team isn't in decent shape. Hosting Cal should be a win, and playing at Arizona State should be another. Then they'll lose to USC if Sam Darnold is half of what he could be, but then they could win at Utah. With Montez in charge of this offense the team should be bowl eligible. Going further than that will depend on what the defense can pull together. Colorado sits at +20000 to win the national title at BetOnline , which is the second-longest price of the 36 teams that the book has listed. At +2500 they are the eighth choice to win the Pac-12. Oddsmakers don't like the chances of a repeat, either - at +1600 they are tied as the fourth choice in their six-team division. The team was a very solid 10-4 ATS on the season, but it was as if there were two different seasons. They opened up at 8-0 ATS and were 10-1 ATS before failing to cover the last three. They went "under" the spread nine times in 14 games. The season win total is set at 7.5, and the under is very heavily favored. It's not tough to see why that is, and as much as I like the offense I just can't strongly advocate for the "over". I like the offense, but I just can't have any faith at all in the defense, and that's a problem. They'll make a bowl but not one anyone outside of the state of Colorado will care about at all. Are you ready for some football winners? Doc's Sports has you covered! We are offering new clients $60 in free picks - these are actually members' picks from expert handicappers who live, breathe and eat college football and have years of successful betting/handicapping experience. Click here for the no-hassle sign up page (no credit card required) . Also, get three handicappers for the price of one when you sign up for a full-season football package! Click Here for details . Click Here for details . Get free weekly free college football picks at Doc's Sports free football picks page .